Almost 400 feet of handmade paper cord. 100 steps from start to finish. 25 colorways. From 14 parts, taking 3 weeks to make, and 2 months to cure; 1 icon of modern design: The CH24 Wishbone Chair, designed by Hans J. Wegner. Arguably the master of Danish chair design, Wegner has a staggering 500 chair designs to his name. He spent his life and career seeking to create the “perfect” chair. With the Wishbone chair, he came as close as anyone ever has. The chair is recognized, beloved, and knocked-off all over the world. In continuous production by Carl Hansen since 1950, the chair’s design is exactly the same now as it was more than 60 years ago. And it’s plain to see this design needed no edits or updates. Wegner created the chair in the mid-1940s as part of a series inspired by portraits of Danish merchants sat on chairs from China. It was kind of a niche inspiration, but the Ming Dynasty emperor’s chairs proved a fertile ground for Wegner’s genius. The Wishbone Chair certainly resembles its 17th-century horseshoe-back chair muse, though Wegner approached his design with signature Danish simplicity of line and little adornment. 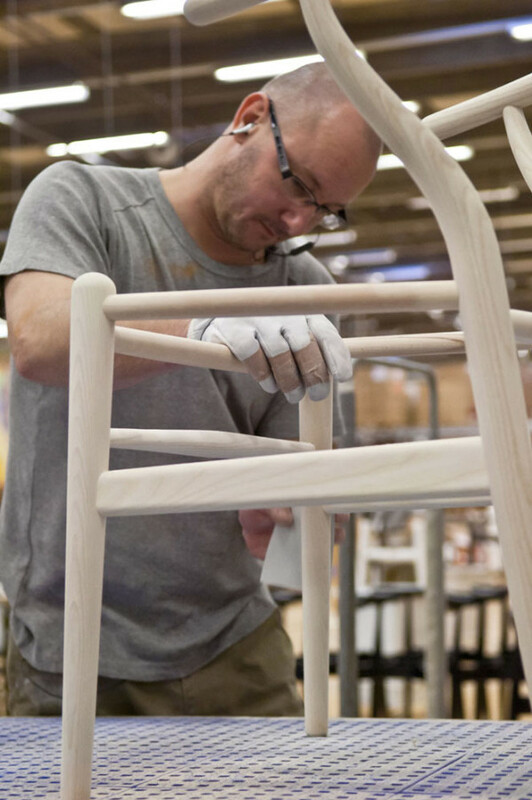 Scandinavian values are also key to the production of this chair–indeed, Danish company Carl Hansen remains dedicated to sustainable forestry. The ash, beech, and oak from which Carl Hansen builds the Wishbone Chair and others are grown mostly in Denmark, under strict domestic and international regulations that preserve the health of forests and contribute to reforestation efforts. American cherry and walnut are also in the Carl Hansen repertoire, and are subject to similar laws. Scandinavian culture has a “waste not, want not” ethos, so it will surprise few to know that every leftover bit of wood (most of which was harvested from trees 150-200 years old) that doesn’t make it to a Wishbone Chair is either repurposed in another project or recycled as heating fuel for local economies. Top left image via. Other images via Design Milk. Master craftsmen work their magic in Carl Hansen’s Aarup studio in central Denmark. Each Wishbone Chair comprises 14 pieces, ingeniously designed to fit together just right. Hans Wegner was a cabinetmaker first, and his experience with joinery and how wood works is evident in every curve. The top rail is bent using steam to create the signature back and arms, and every piece designed to fit into its place without any hardware–just a bit of glue and some terrific engineering make these chairs built to last for decades. Even the paper cord (393 feet of paper cord, to be precise) is hand-waxed and expertly woven for years of comfort and support. Carl Hansen’s master weaver Benny, pictured here, can weave a Wishbone Chair seat in a little less than an hour; his dedication is evident in not only his expert hand, but also his cool tattoo. With its pedigree, style, and covetability, it’s not a wonder why the Wishbone Chair is one of the most copied designs on the market. Less expensive replicas are everywhere, and unscrupulous retailers may even use real images to sell their junk wares online. While an almost-Wishbone Chair might serve the pocketbook in the short term, it will certainly not hold up over time. Authentic design is in it for the long haul, both in terms of construction and design. The little design elements that set a real Hans Wegner chair apart from the pack grow more beautiful and desirable with each passing year; imitation chairs simply aren’t built with the same attention to detail, and over time, the cracks start to show both literally and figuratively. There are several ways to determine if you’re getting a real Wishbone Chair or are about to fall prey to a knock-off artist. First of all, price: If it seems too good to be true, it probably is. Paying for fine design and fine furniture is an exercise in good taste, and ensures great design keeps being produced. You may be able to get a similar look for less, but discerning eyes can tell the difference. How? Construction. An authentic Wishbone Chair is handcrafted from fine materials, and it shows. You’ll see no joinery in the curved back or anywhere else, no hardware screwing the pieces together. The woven seat will be fine, waxed paper cord that is taut and perfectly aligned. Many knock-offs have saggy seats made of nylon, and poorly joined wood scraps with grain that doesn’t quite match. A third cue is that a real Wishbone Chair will have a Carl Hansen & Søn label affixed beneath the main Y support on the underside of the seat. Older models may have a stamp with the name, or a sticker; new products have an aluminum tag attached with the serial number. Finally, if it looks close but something just feels off, take some measurements. Authentic pieces are a fixed size and don’t deviate. Of course, this assumes you can see the chair in person, which may not be the case when purchasing online. If you are shopping online, do business with reputable retailers only.